Are you our next Community Change Agent? Home/News/Blog/Are you our next Community Change Agent? Be a health revolution Eat Better Ambassador! Ten amazing South Africans will get the opportunity to change their lives, and change the lives of hundreds, by becoming Community Change Agents. We are looking for 10 health conscious go-getters to take part in the Real Meal Revolution’s newest Banting Elite programme on Noakes Foundation bursaries. Banting Elite is an online course that provides a unique framework of knowledge and tools that will teach you all you need to know about Banting, and how to educate others about the LCHF lifestyle. A Change Agent is someone who has a passion for healthy eating, and a burning desire to help others. Someone with energy and enthusiasm, and who shares our goal of changing the way South Africa eats! 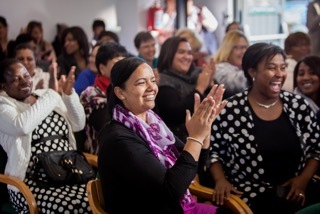 The Noakes Foundation will support successful applicants membership to the Banting Elite online course and to get community groups up and running in your area, township or village. Once completing the eight-week online training program you will have the knowledge and skills to become a Certified Banting Coach where you can then run your own online Banting support groups and become and ambassador. In return, all we ask is that you do your bit for the community and run two Eat Better South Africa! community groups a year. * We are also looking for community based Change Agents that we can train, mentor and support to become Eat Better SA educators that will help us change the world through our various community education initiatives, all while getting paid. Send a short motivational letter telling us a bit about yourself and why you would be the perfect Change Agent. Include where you come from, any community influence you might have, and how your group members would benefit from you being their Banting Coach. Applicants will need to have access to Internet and Social Media. Applicants from previously disadvantaged backgrounds will be given preference. Send letters to: candice@thenoakesfoundation.org before 12 March 2016. Applicants will be notified if their application is successful.